The purpose of this blog is to inform you all about the act of smudging. I got the idea to do this post after learning about aromatherapy in class. Information on the act of smudging can be found in many religions and cultures, and it also shares its roots with incense. Smudging involves the burning of natural herbs (i.e. sage- healing/cleanse, cedar- purify, sweetgrass- bless, and lavender-balance) for a specific purpose. The main concepts of smudging are for healing, cleansing, and/or spiritual purposes. The use of incense can be traced back to around 1530 BC in ancient Egypt. Ancient Egyptians would burn incense during religious ceremonies to not only gratify the presence of gods, but also drive away demons. Through my experiences growing up practicing Theravada Buddhism, I have used incense for a variety of different religious ceremonies. Some Native American shamans use it in their daily practices. The actual history of the of smudging is unknown. The basic way to smudge a household is to get a smudge stick and smudge all of the four corners of a house. 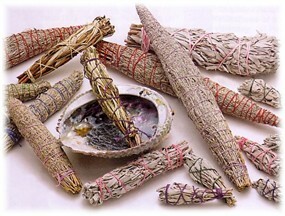 Smudge sticks are herbs wrapped and tied with a natural rope (i.e. natural hemp rope) that is in the shape of a stick. The smoke created from the burning herbs attaches itself to the negative energies around you. As it dissipates, positive energy is regenerated. Smudging the four corners of a house or “four directions” symbolizes the elements (air, fire, water, and earth). I have smudged my household before. I know many people that do it on a seasonal basis. I’m not sure if it drives demons away or not, but the aroma of the natural herbs are soothing. I have several spiritual friends that believe in the positive effects of using sage to smudge for cleansing purposes. I feel that smudging can be interpreted as a placebo effect because you can’t really measure a demon leaving your household; it’s a cure for the mind.